Tiger Woods, by competing at the CA Championship, turned in his second set of PGA Tour scorecards for the year. Though Tiger put on a lackluster performance at the CA Championship (taking ninth only because of his two solid weekend rounds), he certainly turned heads once again. Sure, Tiger has failed to emerge from his prolonged absence as the same player that beat the world's best while playing on one leg, but he has, at least, demonstrated that he is taking form again. 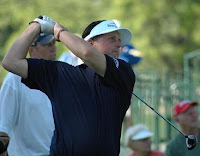 Almost going under the radar was the return of another golfing great: Phil Mickelson (pictured left). Though he hasn't suffered an injury of such epic proportions, his game deserted him over the past year (possibly rivaling the absence of Tiger). With the victory at the CA Championship, Mickelson may finally make things interesting. The "perpetual loser has hot streak then falls into a slump but then returns to greatness" storyline is like something out of a Disney movie. The Masters is four tournaments away. Tiger is looking to prove that he hasn't lost a step after his injury. Padraig Harrington will attempt to demonstrate that he can play with the big dogs, and that his dominant 2008 performance was nothing near a fluke. Now, Mickelson will have the opportunity to reclaim his spot as one of golf's premier players. I can't wait for Augusta. 0 Response to "They're back: Lefty and Woods return to prominence"